Most people refrain from eating any plant with the word "choke" in its name. Thus, the chokecherry is ignored by many who have access to its bountiful crop. That's a shame, for this delicious fruit deserves much more attention than it receives. The black bears know better. In late August when the chokecherries ripen the bruins seek out the trees, pulling them to the ground and stripping off their succulent fruit. In their zeal they often tear the small trees limb from limb to get at the cherries. Raccoons similarly feast on chokecherries, only they tend to do far less damage in the process. Chipmunks and deer mice pick them, extract the stones, and leave the flesh behind. And of course, many species of birds avidly consume the fruit. Though most of us today would find the seedshells in the traditionally prepared chokecherry patties unpleasant, the kernels contain significant quantities of oil and protein. These dried cherries were eaten in many ways throughout the year. 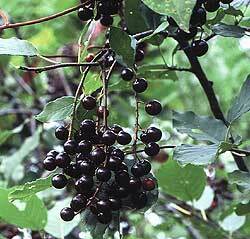 European settlers adopted the use of chokecherries in some areas, particularly the northern Plains. In such localities they have been traditionally used for jam, jelly, wine, and syrup. However, the chokecherry is mostly ignored today, and many people think that they are poisonous. Only very rarely are they eaten dried, as was long their primary use. In the literature on wild foods chokecherries are often derided as second-rate to their cousin, the black cherry, and many authors wholly dismiss them as no better than marginally edible. I disagree, and so did the many thousands of people for whom they were once a staple food. Today, as always, this wild cherry makes fine preserves, juice, jelly, and syrup. Chokecherry leather is still a unique, convenient, healthy, and tasty snack. And every year in late summer, across most of our continent, clusters of these opulent black fruit dangle from drooping branches, offering themselves to the first taker. The chokecherry Prunus virginiana is a large shrub or small tree, usually found growing in small clonal clusters. Typical size for fruiting bushes is one to three inches in diameter and eight to fifteen feet tall. Fruit is occasionally produced on plants only three feet high, and exceptionally large specimens may reach forty feet in height and a foot in diameter. Chokecherry bushes are completely devoid of thorns. The bark of chokecherry is thin, dark gray or brown, and fairly smooth, showing only faint and scattered, paper-thin wavy ridges running roughly lengthwise. The bark also exhibits corky, oblong lenticels about one eighth to one fourth of an inch long. These lenticels appear as slightly raised bumps and are arranged with their longer dimension perpendicular to the trunk. Many of the lenticels bear a perpendicular split in the middle (i.e. the split runs parallel to the trunk), which reveals a light reddish-brown color underneath. It's a cumbersome explanation, but you'll easily see what I'm talking about when you look at a chokecherry tree. 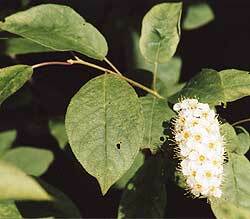 Chokecherry leaves are alternate, 1 1/2 to 2 1/2 inches long, broadly ovate and abruptly acuminate. The edges are finely and sharply serrated, with the teeth usually pointed outward. The foliage is dull green above and lighter grayish green underneath. Rusty wool. The petioles are usually 3/4 to 1 1/4 inches long and bear two glands near the base of the leaf. Chokecherries blooms in late spring when the leaves are just about fully grown. The flowers, about 1/3 inch across, are symmetrical with five petals. They grow in rather tight, arched or drooping racemes, each flower on a pedicel (stem) about a quarter of an inch long. The mature fruit is spherical or oblong, occasionally even with a pointed tip. They are dark purple to black when fully ripe. About one quarter to one third of an inch across, each drupe contains one proportionately large oval stone. The cherries are borne in drooping clusters three to six inches long, each containing about eight to twenty fruits. Although chokecherry is easy to learn to recognize, it bears some resemblance to several common small trees. Many country dwellers do not differentiate between the chokecherry and smaller specimens of its close relative, the black cherry. Since I greatly prefer the flavor of the chokecherry, the distinction is important to me. Black cherry has much darker green shiny, and lanceolate leaves, fruit that is longer and more spaced-out racemes, and smaller, more numerous, and more distinct lenticels. Common buckthorn Rhamnus cathartica, a powerful cathartic, differs in the presence of thorns and in that its fruits each contain three to four seeds. From a distance the toxic glossy buckthorn Rhamnus frangula looks similar to the chokecherry. It's growth form and bark are nearly identical, but closer inspection shows that the leaves have smooth margins and the fruit, which grow in small clusters from the leaf axils, contain 2-3 seeds. And finally, chokecherry can be told from any other woody plant at any time of year by its distinctive scent, which one can experience simply by scratching the bark off of a twig or a small branch. The chokecherry is said by some to be the most widespread tree in North America. It is found from Newfoundland to British Colombia, through all but the most northern of our boreal forests. It ranges across the northern half of the United States, being found in the Appalachians south to Georgia and in the Rockies through southern Arizona and New Mexico. It is often a conspicuous feature of the vegetation. The chokecherries of the Southwest, said to be darker in color and less astringent, are classified by some as a separate species Prunus melanocarpa. Chokecherry is a riverside shrub. It tolerates wet or dry conditions and thrives upon disturbance. Like many other native riverside species - hawthorn, plum, riverside grape, pokeweed, milkweed, boxelder, American elm, and cottonwood - the chokecherry has been incredibly successful at colonizing old fields, roadsides, fencerows, railroad right-of-ways, and forest edges. It's frequency in such upland sites belies the fact that its principal natural habitat is riversides. The chokecherry is also locally abundant in some dry, open woodlands, pine barrens, cutovers, and swamps. Chokecherry is tolerant of moderate shade but requires a generous dose of sunlight to bear much fruit. The greatest threat to the culinary reputation of the chokecherry comes from those who gather the fruit when it is under-ripe. Chokecherries should be left on the bush until they are dark purple-black, showing no hint of red - and after that, they should be left on the bush another week or so to over-ripen. Such cherries will taste immensely better than those hastily collected as soon as they darken, as their astringency will be greatly reduced. The time to collect chokecherries is from the middle of August into early September. Oftentimes the fruit appears ripe in late July, but beware the reddish tint; these early chokecherries are generally of inferior quality. Where I live the peak season for chokecherry picking coincides almost exactly with the harvest of wild rice: August 20 to September 5. The flavor of fresh chokecherries varies quite a bit from one tree to the next; some are very astringent, most are somewhat astringent, and a few are not astringent at all and are wonderful to eat right off the bush. Some people never develop a liking for fresh chokecherries. The puckering mouth that they induce is a sensation, not a flavor. If you can learn to not let it scare you off you will be free to discover that the flavor behind the pucker is really pretty darn good. Chokecherries often grow in profusion and one can collect them rather quickly by stripping one cluster at a time into her hand. Certain clumps will yield several gallons of fruit, and in a good place you can gather two or three gallons per hour. When picking, keep an eye out for stinkbugs and conscientiously remove them from your pail. I collect chokecherries (and most other fruit) with a one gallon container that I tie around my waist with a string, which leaves both hands free for picking. Sometimes I use a berry hook to hold down the higher limbs, but if you do this be careful not to wantonly break branches like the bears do. Luckily chokecherries are not as soft as most other fruits and therefore do not crush as easily in a big pail. Neither do they spoil as readily as most small fruits; you can keep them for a few days at room temperature after collection, and for several days longer in the refrigerator. Probably the most popular use of chokecherries is for jelly. To do this, first you must extract the juice. After cleaning out the leaves, twigs, and invertebrates, place your chokecherries in a large pot and pour in a little less water than it would take to cover the cherries. Simmer for a few hours until the cherries are soft and have released their juice, then take them out and strain through a jelly bag or a cheesecloth-lined colander. You will get around a quart of juice for each gallon of cherries that you start with. You can then drink this juice as is, can or freeze it for future use, or use it to make an excellent jelly or wine. Instead of boiling your chokecherries in plain water, you can start by pouring the juice from boiled apples over your chokecherries. This will tone down the potent flavor and, more importantly, add some pectin and malic acid to the jelly to improve its flavor and jelling. Instead of making juice, you can also puree the fruit through a colander or food mill to strain out the seeds and use the pulp to make jam, preserves or even pie. Another traditional confection is chokecherry syrup, made by mixing the juice about half and half with sugar, perhaps with a little pectin to thicken it. This is eaten on pancakes, ice cream, or muffins. All of these chokecherry products are delicious, and they are where I began my culinary experiments with this excellent fruit. Today, however, almost all of the chokecherries that I eat are in the form of dried fruit leather. This is convenient, delicious, and healthy since it is unadulterated by the addition of sugar. To make chokecherry leather, I begin by straining out the seeds with my Victorio strainer. (The Victorio is made primarily for apples and tomatoes; to strain chokecherries with it you must remove the spring that pushes the augur against the screen, otherwise it will clog with the pits.) Then I spread the puree thinly and evenly on baking trays and dry them in the sun. You need to flip the leather over with a spatula when it is about half dried so that it does not stick to the bottom of the tray. Before flipping the leather over I cut it into manageable strip about four inches wide. The chokecherries generally dry in about one and a half full days in the sun. The fruit leather is then folded up and stored in sealed plastic bags, and I just take some out whenever I get the munchies. I used to dry chokecherries with the pits in them, simply because I didn't know of a good way to separate them. When I ate the cherries, I would just spit out the seeds as I went. This tasted good, but the pits were very annoying. The Native Americans also lacked an effective way to separate the stones, but instead they pulverized the entire fruit, seeds included, before drying in the sun. Although the seeds are reported to contain significant amounts of prussic acid (a cyanide compound) the kernels were mixed in with the dried fruit and eaten in substantial quantity on a regular basis. It has been presumed that the drying process breaks down or otherwise gets rid of the prussic acid, rendering the pounded chokecherries harmless. I have eaten a small number of chokecherries this way, and the kernels definitely add a nice flavor and a substantial number of calories to the mixture (in fact, probably more calories than the fruit's flesh) but I find the seedshell bits unpleasant to munch on. After drying, the flavor of chokecherries mellows and becomes much less astringent, to the extent that almost everybody enjoys eating them. This year I made many pounds of chokecherry leather. Throughout the winter I will eat them as a trail snack, along with a meal, or just as something to nibble on when I'm writing or working. I also like to throw bits of dried chokecherry into my breakfast cereal, applesauce, soup, pancakes, or bread. And occasionally I'll pour myself a cold glass of the refreshing chokecherry juice that I canned this summer. All told, there are few fruits that I will eat more of than this wonderful, neglected, and often maligned wild cherry. I sure hope that I don't choke on them.